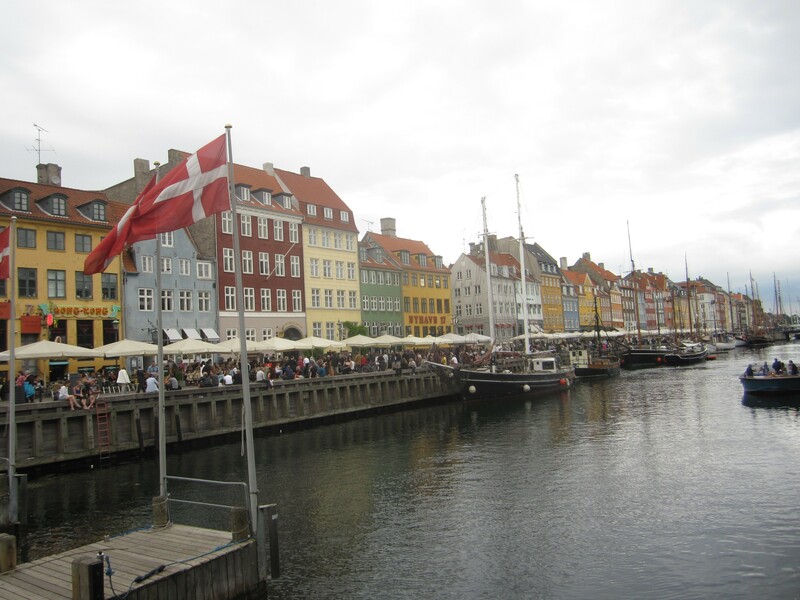 Copenhagen, Denmark, what an intriguing and important city in the world’s gastronomic landscape. The city itself is truly unique. There are dashes of Scandinavia intertwined with the quirkiness of Portland, Oregon, the flatness of the Midwest, the individual pride and creativity of San Francisco, and momentary flashes of New York and Tokyo subways at rush hour when you see a Copenhagen bike lane around 5 pm. This is a city built on two islands (Zealand and Amager), within a stone’s throw of Sweden to the point that Malmö is essentially a branch of Copenhagen (or vice versa depending who you ask), yet Copenhagen certainly does not have the strict, orderly manner or the sparkling, Monte Carlo-esque cleanliness of that country to the north. 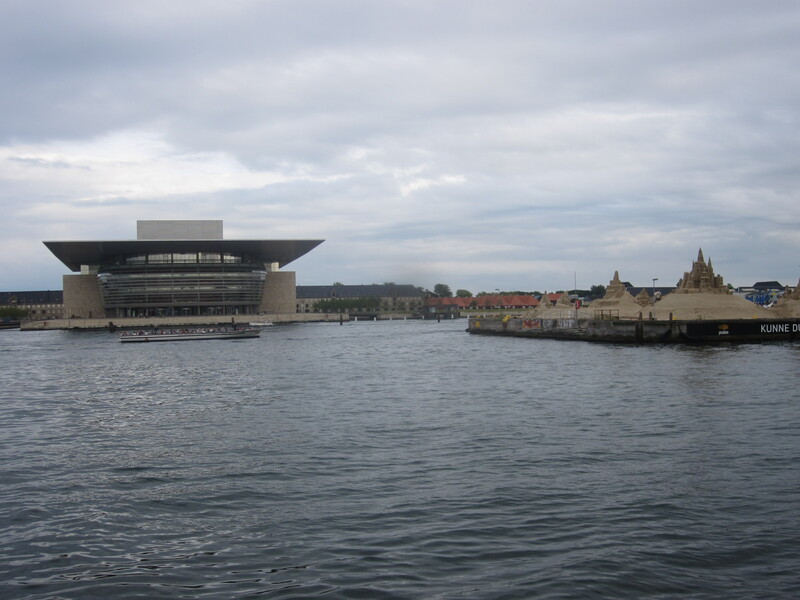 Copenhagen resides on two islands with more man made islands to go with that. Copenhagen is a city where 55% of its residents commute by bike. On one street in Copenhagen’s Norrebro neighborhood reside not just one of the city’s best restaurants, wine bars, bakeries, and coffee bars– they are all among the world’s best in their genres. And they are all within two blocks on the Jaegersborggade. Copenhagen has two islands and it also has two main canals, along with various other tiny canals. It’s Venice without the classic elegant architecture. It’s Amsterdam without the orderly city planning. It’s hard not to get lost in Copenhagen. Those two canals are excellent landmarks– the larger canal separates the center of the city from Christianshavn (the man made island where Noma and the stunning opera house can be found), while the other side of the city features a set of smaller canals that serves as the unofficial morning jogging route for locals. 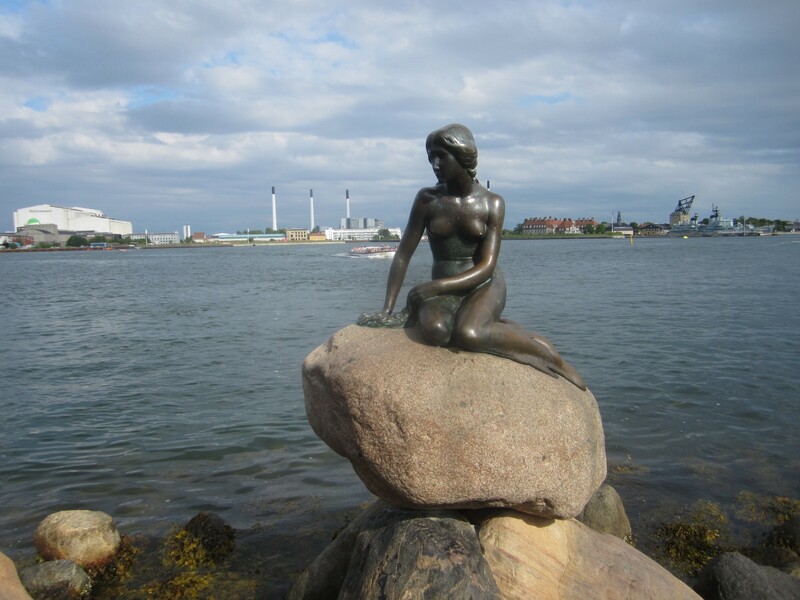 Of course, Copenhagen is home of the Little Mermaid (she wouldn’t want to swim in these canal waters…), who is indeed petite compared to Venus di Milo, for sculptural comparison. 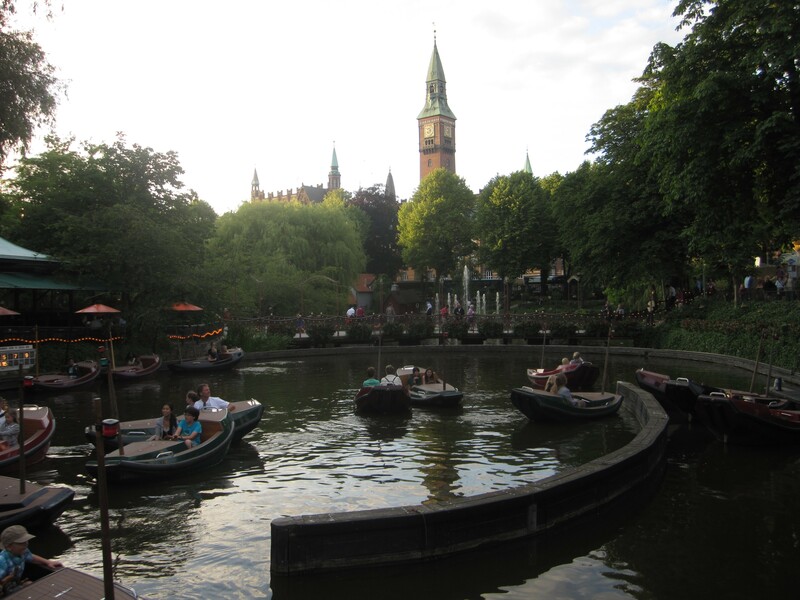 It is home to arguably the world’s greatest amusement park, Tivoli Gardens, where “amusement” has not yet been lost on corporate greed. 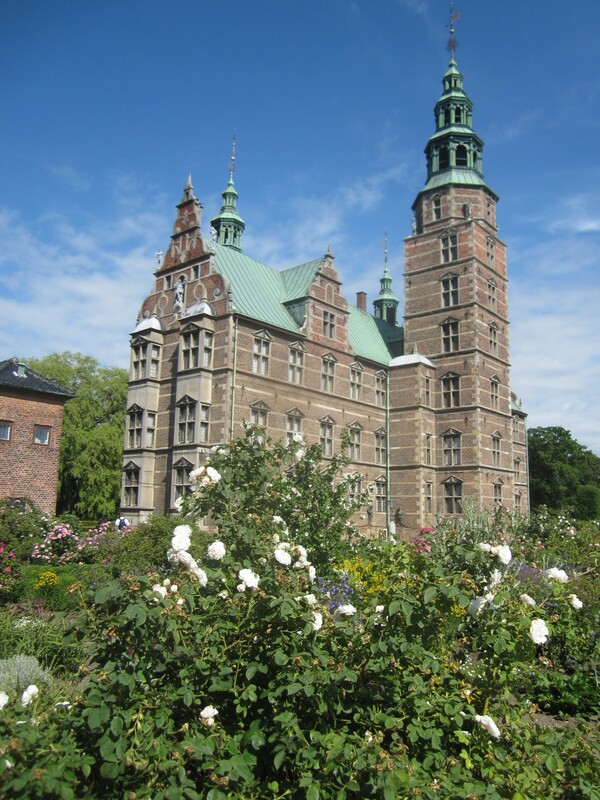 Copenhagen boasts several excellent museums, especially the NY Carlsberg Glyptotek next to Tivoli with its terrific French impressionist collection. 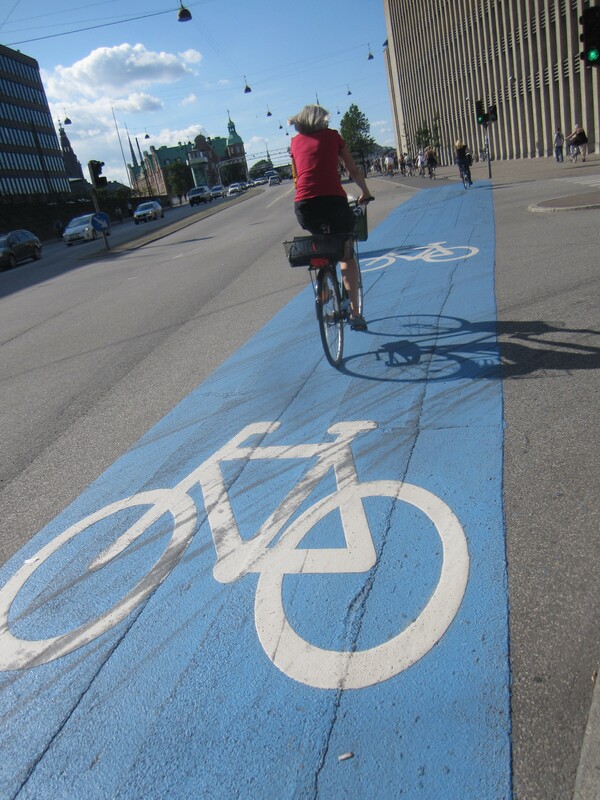 Copenhagen is one of the world’s leaders in environmentally friendly products and ideas, with its imposing bike lanes being the most obvious evidence of that. One feels the same in Copenhagen when bike-less as you might in Los Angeles without a car. All of this and Copenhagen, Denmark’s capital only has a population of just under two million people. It may be an important European capital, but Copenhagen is not a striking power à la Paris, Vienna, Rome, et al. Really, the power comes from the New Nordic cuisine movement that is the worldwide rage of the moment. 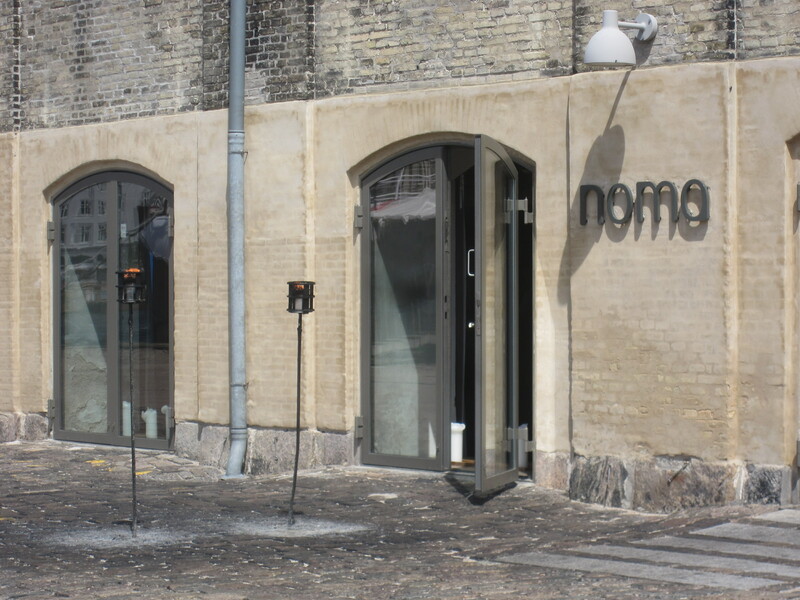 It is basic knowledge now to know that the world’s “best” restaurant resides in Copenhagen, Noma. As covered recently in depth, I firsthand would agree that a meal at Noma is as special a meal as the world has to offer. The “best” discussion doesn’t work for restaurants like the gold medal symbolizes the world’s best sprinter (does anyone question if that is or isn’t Usain Bolt?). The New Nordic cuisine, started by Noma, spread across Copenhagen with the young chefs leaving Noma, opening their own spots, similar to honeybees carrying pollen flower to flower. 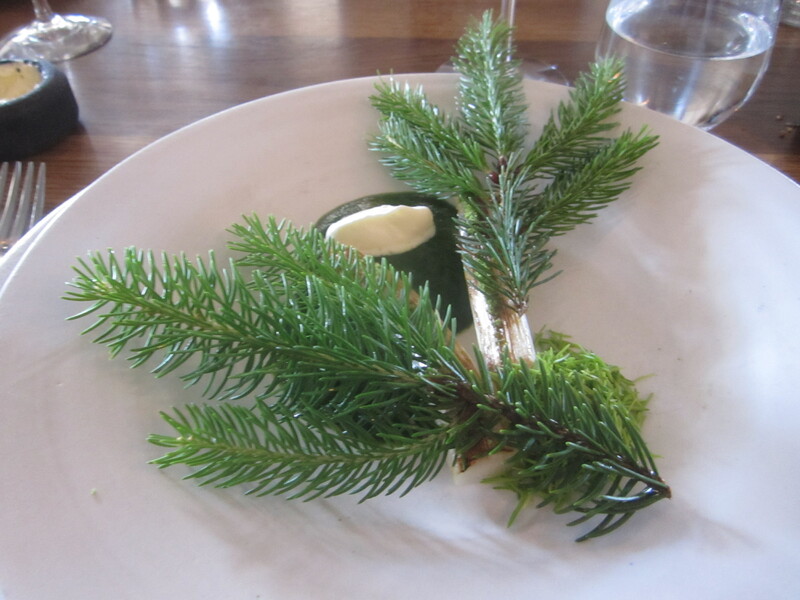 New Nordic cuisine is about the appreciation of the Nordic indigenous ingredients. Denmark, Sweden, Finland, and Norway are not exactly Spain or California when it comes to agriculture friendly climates. The young chefs, like Rene Redzepi of Noma, embraced this challenge, added the modern concepts of chefs who toy with lightened haute cuisine in the U.S. and France, and molecular gastronomy in Spain, then turned white asparagus into a transcendent dish with elderflowers and oysters from local waters. French oysters are great…until you’ve tried the ones from the Danisk Limfjords at Noma or Copenhagen’s Kødbyens Fiskebar. Copenhagen has a dynamic restaurant scene, from innovative Thai at Kiin Kiin to Geranium 2, the domain of the 2011 Bocuse d’Or winning chef, Rasmus Kofoed. Kødbyens Fiskebar, in the Meatpacking District that still looks a lot more like the name than the nightclub centric neighborhood of the same name in New York, is a delightful, sleek dining room with a complete oval bar dominating the center. Go here for drinks and graze on those giant, plump oysters, and a few small plates. None are clunkers. 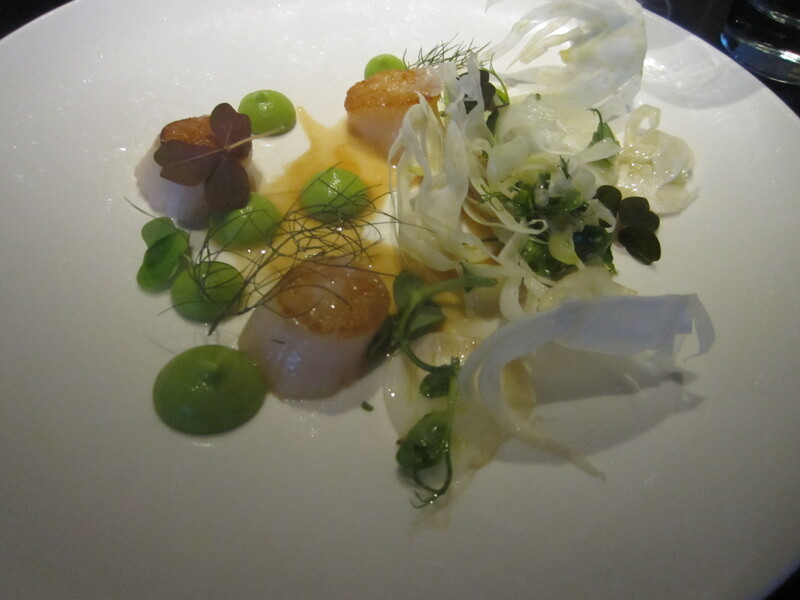 Some are merely fine, others such as Norwegian langoustines teamed with glazed celery, dashi, and potato, or the lone fish large plate of baked cod in a sauce of pine, wood sorrel, and riesling, with Jerusalem artichokes, and green and white asparagus are stellar. There is even a jellyfish tank for a pillar in the room and beware of crashing into mirrors in the trip of a bathroom. Strangely at the Fiskebar, service was spectacularly off- track. It took an hour just to receive a plate of oysters, not even cooked. Then additional head-scratching times to receive small plates and large plates to the point that dessert was ordered when the final main plate arrived (and then arrived while the main plate was still on the table…). 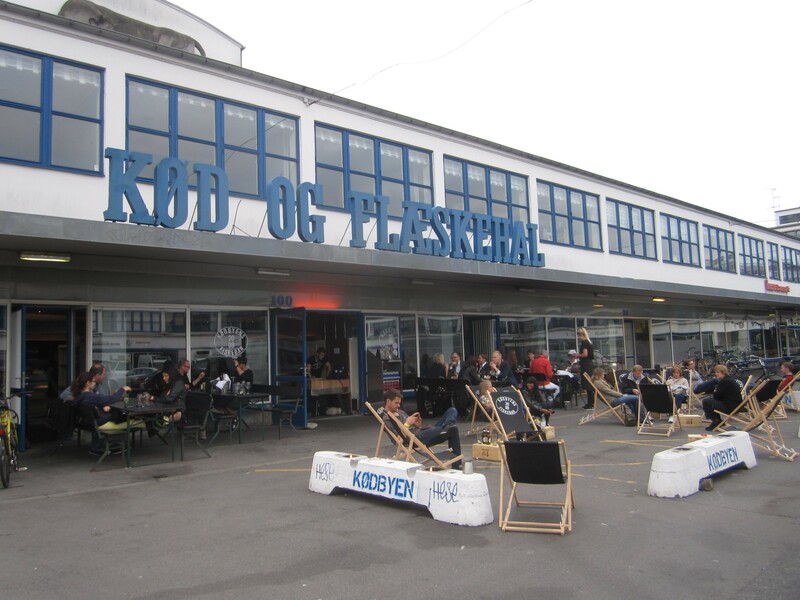 It was a complete system breakdown for the service at Kødbyens Fiskebar, for a reason far beyond me. It made me feel terrible for them. The waitress wasn’t even around to give us the check. At the same time, diners at our table were ready to mutiny me for recommending the restaurant for the service miscues. The food represents the best of Copenhagen’s culinary prowess. The rest of the restaurant experience…could be the Cheesecake Factory in Wichita. Perhaps my favorite experiences of Copenhagen outside Noma, were in the fantastic hands of Bo Bech at Geist and Adam Aamann. Bech’s concept at the spectacularly handsome, Riviera like Geist, should be replicated everywhere. Every dish is a small plate– larger than an appetizer and smaller than an entrée. Prices are reasonable for Scandinavia. 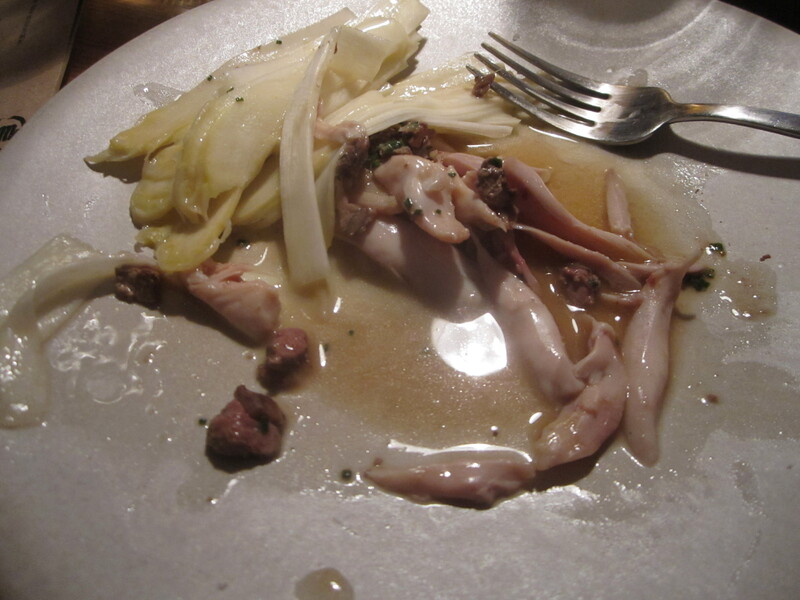 Each dish has a modern flourish and a surprise. Turbot that melts on the fork comes with fennel ravioli, where gruyere cheese serves as the ravioli “dough.” Bech creates exquisite vegetable dishes: peeled, pickled tomatoes with stone crab and mint, or the grilled avocado topped with sliced green almonds that have the consistency and appearance of soft white chocolate. I’d go back just for the tender lamb hearts tossed with ginger, lime, soya, and sesame. Then again, the dish that still is in my dreams is the aromatic banana tart with maple for dessert. Bech used to own a bakery with only one bread on sale. That sourdough is now only served at Geist. Take advantage of this. 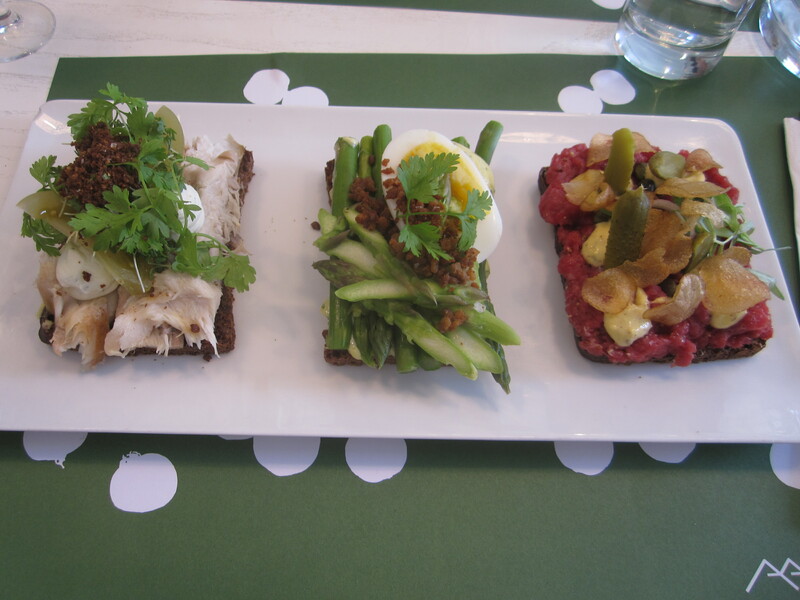 Aamann’s is changing the concept of smørrebrød, the often banal open faced sandwiches eaten often for lunch. You can get excellent traditional varieties at Ida Davidsen, Sankt Annae, and Schønemann’s. At Aamann’s, you get edible landscapes atop the wonderful house baked sourdough rye bread. Think smoked mackerel on ramson strained yogurt with pickled green tomatoes or braised pork breast with rhubarb, apple vinegar, and crushed pork rinds. New York is lucky that Aamann’s is creating an outpost there. Do not even think of skipping the homemade snaps here (hope for elderflower to be served!). And for your breakfast and picnic, a stop at Meyers Bageri is obligatory for possibly the finest brownies I’ve ever sampled and the signature, superb Olandshvede bolle, a sourdough wheat boule. 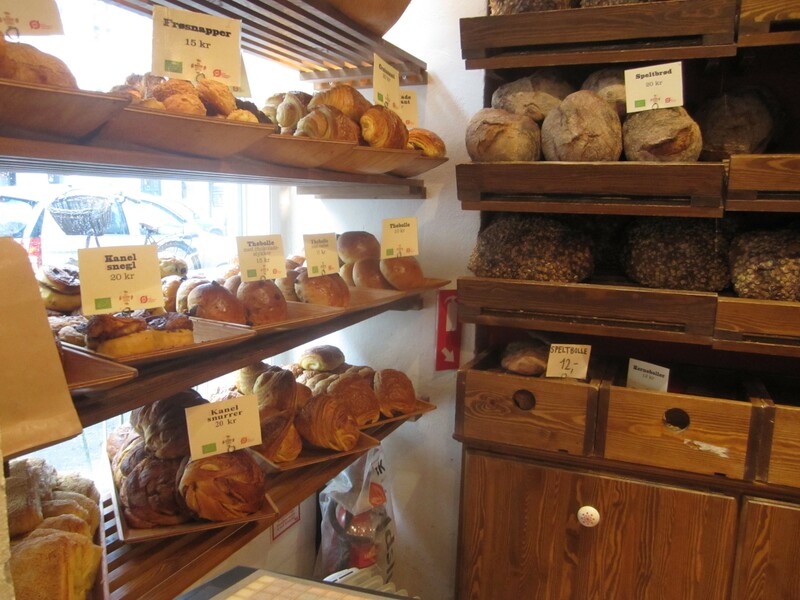 Claus Meyer, the owner, is creating a mini empire of these bakeries. Mr. Meyer also owns one of the city’s best restaurants, Radio, and we must not overlook that he co-founded Noma with Redzepi. 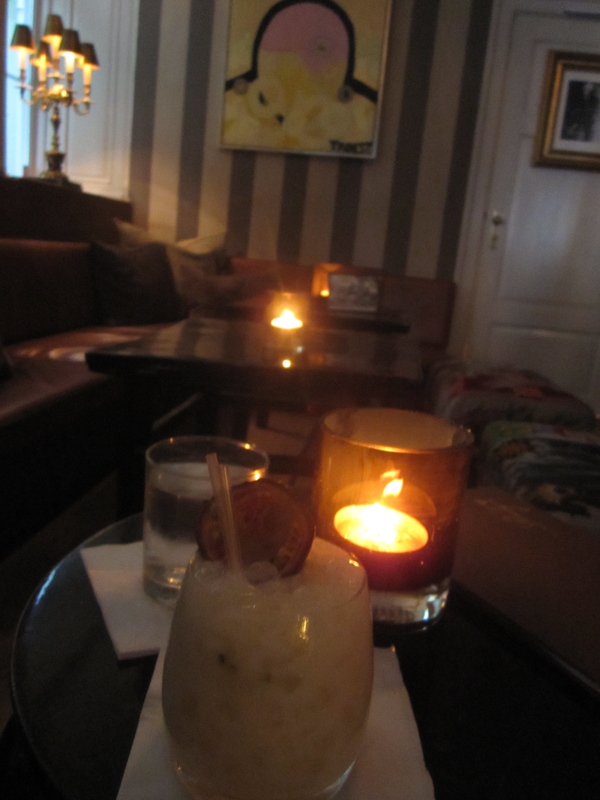 The cocktails in Copenhagen are more precise and exciting than anywhere else in Scandinavia. Frankly, it’s not even close. You’ve got world renowned craft brewers and baristas here. There is a lot more than just Noma. It’s safe to say though, a lot of this would not have happened without a little of the Noma effect. I could eat any of Aamann’s open faced sandwiches for lunch every day. This version is an immaculate steak tartare on immaculate bread. 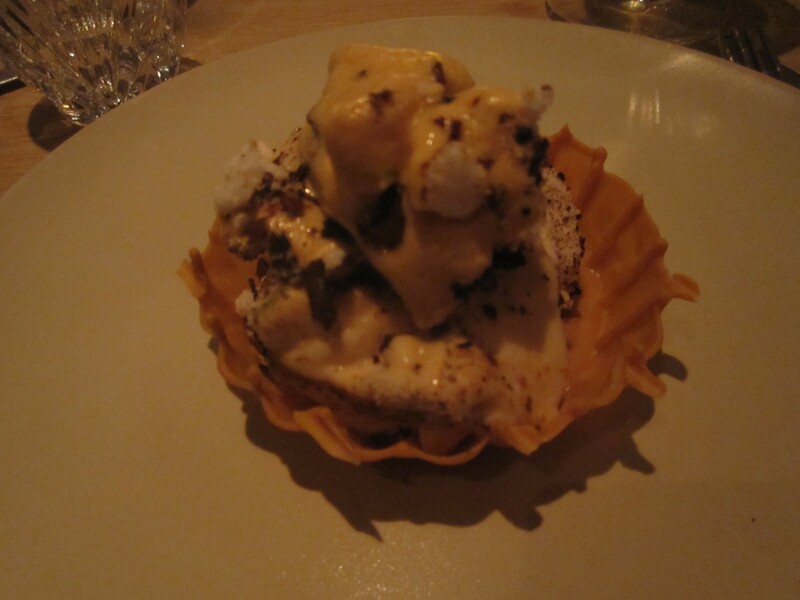 Inside a tuile cup, bananas, banana ice cream, and maple sauce create a magical sundae. Anybody who knows my tastes of banana and maple understand how this dish means everything to me. In my mind, the symbol of Noma. Purity, restraint, and yet so forward thinking. Pine may be the world’s greatest ingredient. I don’t have a picture of the crispy pork skin and black currant roll snack served at Noma, which would defeat the Hen and the Egg. But here you have the consummate omelette with bitter notes, floral notes, some spice, and some crunch. 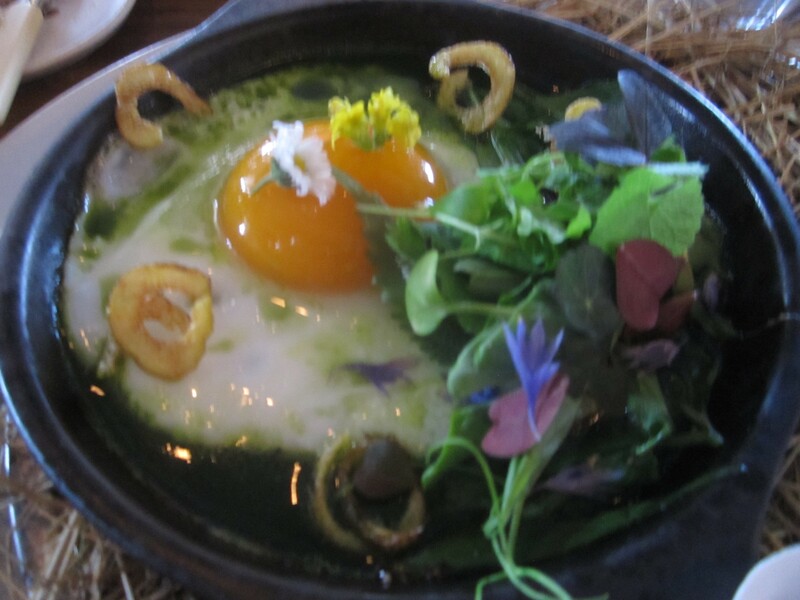 The real memory of course is that you create the dish yourself…at the world’s “best” restaurant. So I guess that makes me a great chef? A stellar creation by Christian Puglisi– the softest of chicken thigh meat and chicken heart gets the sous vide vacuum treatment, then enveloped in a foam laced with briny anchovy, covered atop by thin slices of the softest white asparagus. Not enough color going on here. That can’t be said at all for the tastes. Let’s think long and hard about that one. New Nordic Cuisine…what a shocker. From the oysters at the Fiskebar to anything at Noma to the Goat’s milk brie from Søvind on one smørrebrod at Aamann’s, local ingredients and traditional dishes viewed through brilliant, young minds has captivated Copenhagen, and now is captivating the world. The problem: it doesn’t work in non Nordic countries. Chefs will try anyways. Bar 1105, a tiny, glamorous hideout, run by Briton Gromit Eduardsen, crafts spectacular drinks that could compete with the best in the U.S. In fact, his superb cocktail “No. 4”, and the winner here, is served as a guest cocktail at Cedars Social in Dallas (every bit as impressive as Bar 1105). 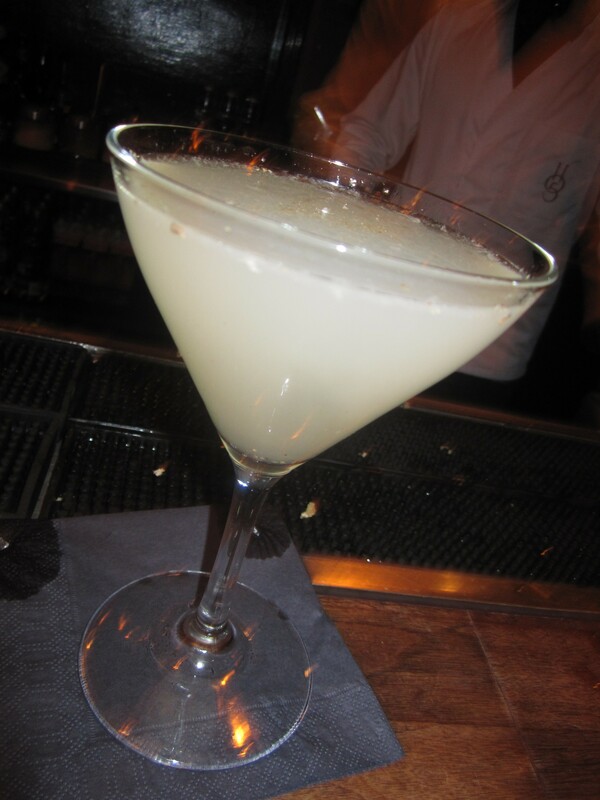 Served chilled and up, it’s a beautiful blend of Beefeater gin, black pepper, cardamom seeds, lime, and honey. Oh yes, it’s a bit spicy, but smooth. Dizzy Gillespie jazz in cocktail form. A close second would be the “Senor Hansi” at 1105, described as a Mexican wanders into a bar seeking passion, and falls in love with a German. That’s also known as tequila, agave syrup, lime juice, and passion fruit, topped with a weissbier foam. I wanted to love Ruby, a stately 18th century town house turned into elegant craft cocktail bar. The “Rapscallion” is a lovely, smoky blend of Talisker Single Malt Whiskey and Pedro Ximenez sherry in a glass rinsed with Pastis. But avoid the drink of passion fruit seeds and condensed milk on crushed ice, a cocktail that had one member of my party swearing off condensed milk for the rest of his life. I can’t disagree. Bonus points for the handsome atmosphere and the fact that you think you’re entering the Georgia embassy when walking into Ruby. The Union, K Bar, and the American steakhouse MASH are all other excellent cocktail choices. Beer first. Copenhagen is home to Mikkeller, the brews of the nomadic, globe trotting gypsy brewer Mikkel Borg Bjergsø. His very spare, modern designed bar features ten Mikkeller beers and ten guest brews. It is indeed paradise for the world’s beer lovers, in a way their “Noma.” Sample a heavy stout and a single hop IPA like Nelson Sauvin. The Vesterbro Pilsner is surprisingly calm for a Mikkeller beer and one of the more robust pilsners you’re like to find. The place gets packed each night and beware of the stout aged in tequila barrels. 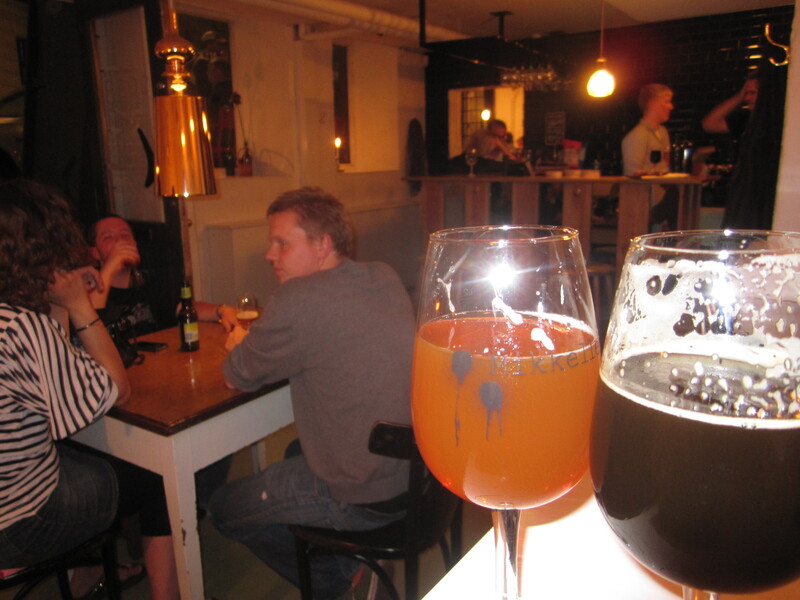 Norrebro Brewery is another great microbrewer and restaurant. 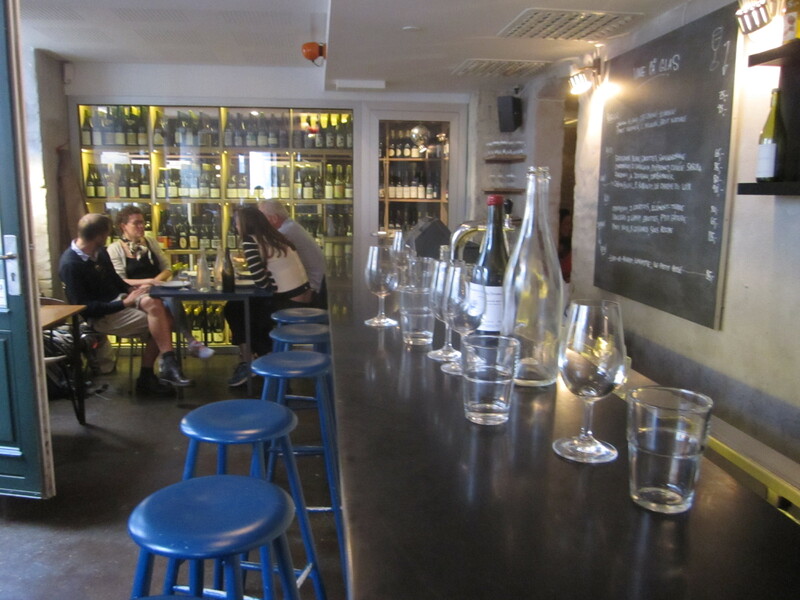 For a glass of wine, grab a seat at the bar of Manfreds & Vin, across the street from and owned by Relae. The staff all are encyclopedias on French wines. 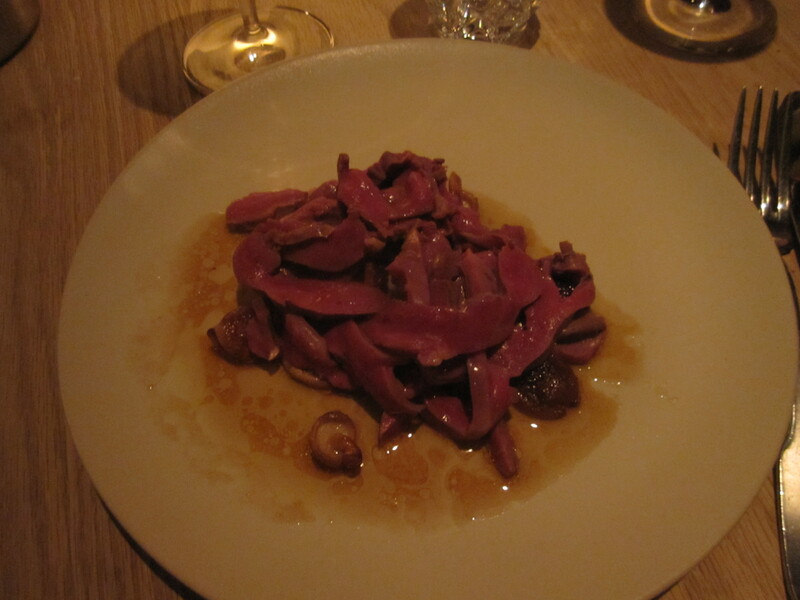 The food happens to be every bit on par with Relae too, without the glacial indifference of the staff there. 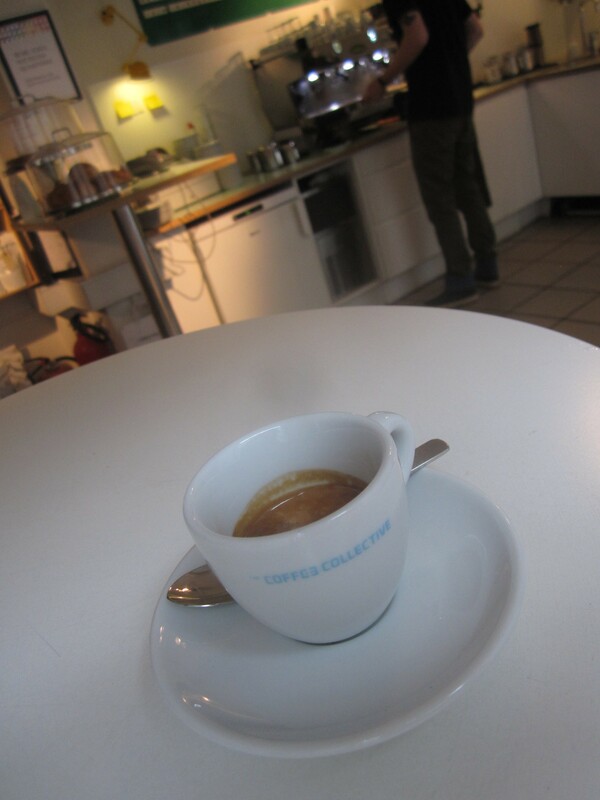 Yes, right now, let’s go to The Coffee Collective for spectacular espresso. Or slow drip coffee. The shop itself is more a roasting room, so to linger, let’s go to Sweet Treat on Christianshavn. That would also be René Redzepi’s cafe of choice. He prefers the ristretto, but you really want the real espresso here. Sandbox on the canal, next to the Opera House? This entry was posted on August 17, 2012 by trevsbistro. It was filed under Copenhagen, Greetings from... .